Patterned exterior white marble bath. Carved large grooves in a step design. Another way to describe it would be that there are fluted on the outside of the double ended tub. A statement of solid luxury. This is one of the many style options for a freestanding marble bathtub. 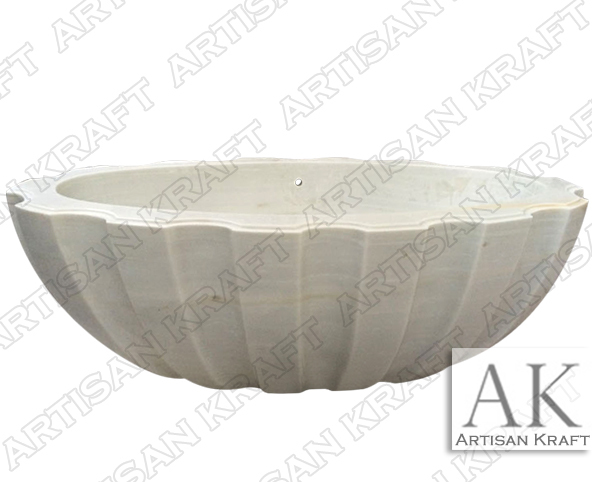 This white marble soaking tub is currently in stock and on sale. Visit our showroom store for more details. This tub is set up in our Chicago showroom. Setup an appointment to visit.